Our main image shows a bespoke twist engagement ring, created through custom-made design available at Serendipity Diamonds. What is a Twist engagement ring? 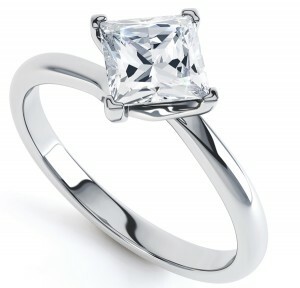 A twist engagement ring typically features a sweeping effect in the claws or shoulders of the ring. Many variations of the twist exist. 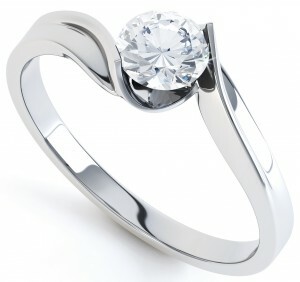 For example, a partial spiral turn makes an appearance in many twist styled engagement rings. Furthermore, this simple styling feature adds flowing movement. The addition of micro-set diamonds into twisted shoulders comes through modern jewellery setting techniques. 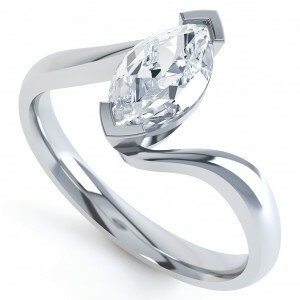 Diamonds as small as 1mm feature within the Burlesque ring design as shown below. Why has the twist solitaire engagement ring become so popular? When it comes to the simple styling of a solitaire diamond ring, the addition of a twist adds interest without over-complicating the design. 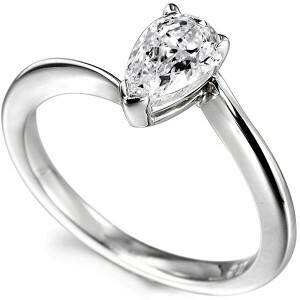 In addition, many twist engagement rings sit lower on the finger. As a result, many twist styled rings offer practicality for day-to-day wear. The twist design has been popular for centuries and an important feature in jewellery design. Incidentally, the twist engagement ring setting is seen in all forms of jewellery—not just engagement rings. 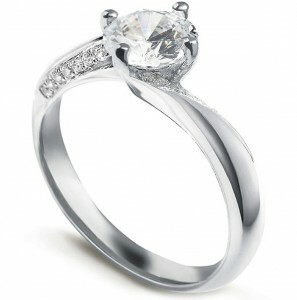 The ‘Burlesque’ twist engagement ring features contoured diamond set shoulders. 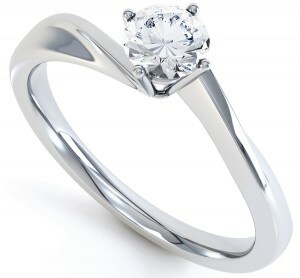 The original twist engagement ring design remains the most popular design to date. 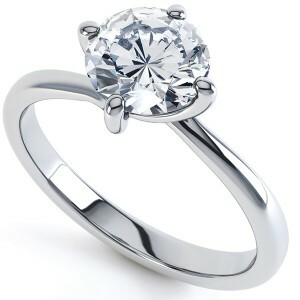 This is still our best selling engagement ring. Why? Because “Twist” as we call this design, blends a simple twirl with a sensibly low setting, from narrowing shoulders. The comfortable courted band on this design is substantial yet delicate. This style also benefits from a matching shaped wedding ring, pre-designed for convenience. In a nutshell, this exceptionally simple design submits to the demand for a simple, minimal setting — one that allows light to literally flood through the diamond. Many believe that if you’re purchasing a beautiful diamond, the setting should do the very best to show off the brilliance. 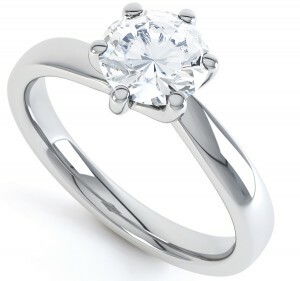 This ring design reveals most of the diamond with dramatic effect. The twist effect tension style setting of Unity is built around your diamond, to ensure a precision fit. Compass settings secure a diamond by positioning claws at cardinal points, North, East, South and West. 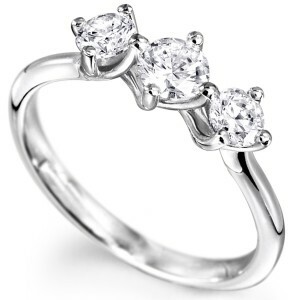 This contrasts with the traditional squared arrangement of claws or prongs. The original twist setting (see above) and the Pirouette ring design both feature a compass arrangement of claws. Pirouette differs by bridging each claw with a discreet under-bezel for additional strength. The six claw twist, offers greater security for peace of mind. Although four claws remain extremely popular, for large diamonds, six claws secure the diamond around the outer edge. Generally, for smaller diamonds, four claws are generally recommended allowing more of the diamond to be viewed. The addition of diamonds on each shoulder, adds an enchanting sparkle that completes the look of a finished ring. Our twist engagement ring collection would never be complete without a diamond shoulder version. For example, Burlesque elegantly blends the twist setting with delicate, grain set shoulders, beautifully contoured for a truly unique look. By now, you will no doubt realise just how many different designs exist for the twist setting. “Sway” offers the wearer the chance of individuality, by dividing each shoulder, weaving the split band with striking results. Despite the modern round brilliant cut diamond being the most popular diamond shape, the princess cut follows closely behind. For instance, “Florence” adopts the compass styled arrangement of claws, within an effective twist design. This style requires a near perfectly square diamond. 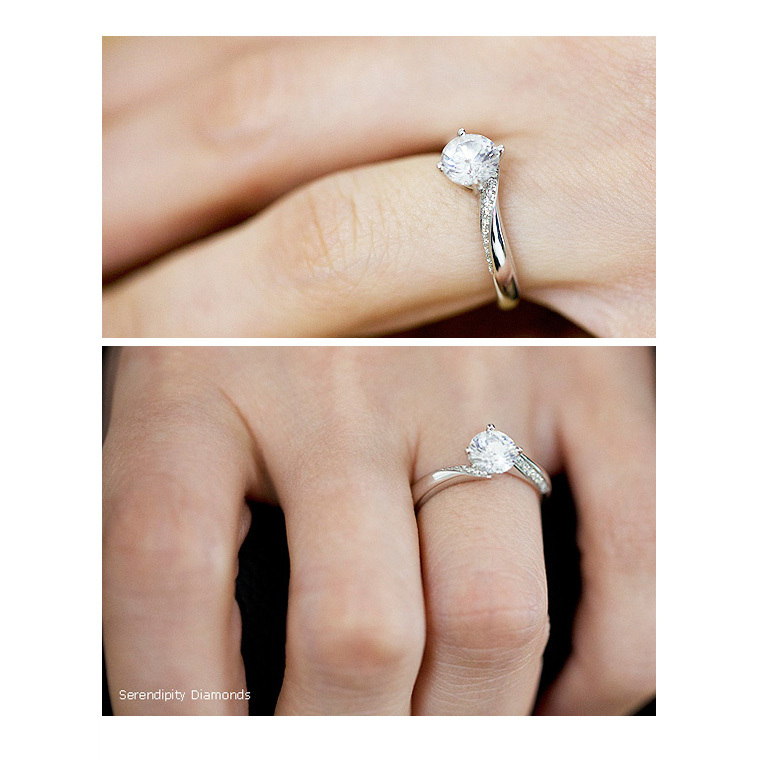 We build each marquise twist engagement ring around your chosen stone. This elegant twist style is most dramatic, owing to the greater distance between each shoulder. Fine ‘V’ shaped claws protect the diamond points. 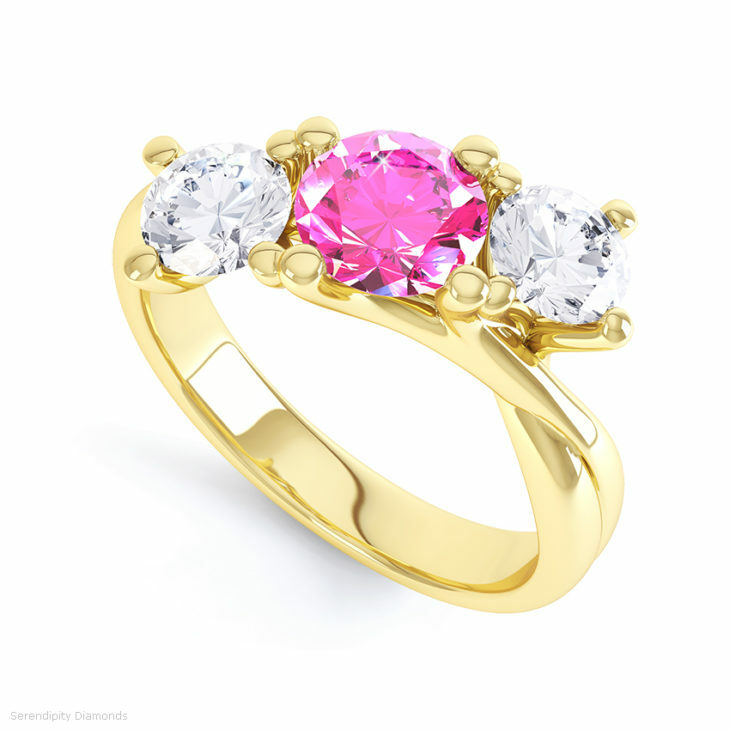 In addition, you might wonder about wedding rings suitable for such a design. Our fitted wedding ring service ensures a perfect fitted wedding ring, adding greater individuality. There is something majestic about the pear-shaped diamond. Beyond rounded edges the eye draws to the defined tip. 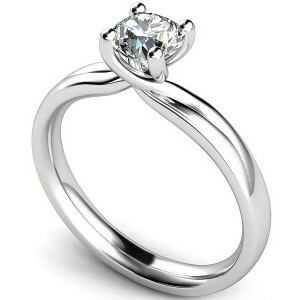 Beautifully a Pear shape appears defined within this three claw setting. 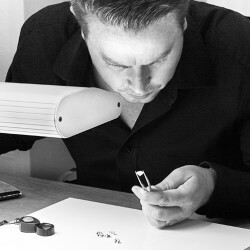 In addition, we craft and create highly detailed and personalised shaped wedding rings to fit. Compared to a standard band, a fitted ring makes perfect sense. Inspired by our four claw round solitaire twist design, the three stone trilogy twist creates an altogether new, and unique ring design. Each diamond rests along a unique style with three interwoven twist settings flowing from one shoulder to the other seamlessly across the ring. As a result of advanced CAD design, styling is limited only by imagination.